Our product range includes a wide range of Employee Administration such as Employee Database Payroll Software, Unlimited Employee Categories Payroll Software, Organization Tree Payroll Software, Employee Letters Payroll Software, Employee Directory Payroll Software, Mass Mailing and many more items. With the Help Desk feature, employees can open a ticket for various issues or requirements that they may have. Depending on the issue category, the tickets are routed to the concerned department which could be HR, administration, IT, finance, etc. This is a boon to improve internal services standards and monitor SLAs. This eliminates the unnecessary involvement of personnel and instead, is taken care of by a smart and automated system through employee self service. We are the reliable service provider in the market, offering best Salary Slips Payroll Services. This service is related to the preparation of monthly salary sheet, deduction as per the applicable laws like income tax, provident fund etc. It provides you the 100% accurate and professional looking pay-slips, instantly, and without any effort. 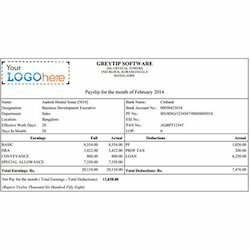 Moreover, you can also customize the appearance and content of your salary slips. Looking for Employee Administration ?